Sundar Pichai, the India born CEO of Google has visited India this week and has made many remarkable announcements which showcase their vision towards the country. Mr Pichai addressed the session with media, developers, entrepreneurs and marketers at an event in SRCC College, New Delhi. Here are the 10 things which Sundar Pichai made in the announcement during the meet. 1. Google will help women from 3, 00,000 villages across India to get them online. Google is working to empower the women community in India. In its pilot project focused on women provides internet access to women in India. The project will cover 3, 00,000 villages in 3 years and the company has shared a video to showcase its initiative towards this campaign. 2. Huge new Google campus in Hyderabad will be installed.Google is expanding its presence in India and for this it is building a massive new campus in the southern city of Hyderabad. This will provide India many new Google products and services. The campus will be the largest outside US. 3. 500 railway stations in India will get Wi-Fi service by 2017.Google CEO said Mumbai Central will be the first of the 100 railway stations, getting Wi-Fi connectivity by December 2016. Sundar Pichai underlined the search giant’s intention to push for more internet adoption in India, announcing free Wi-Fi in 100 railway stations as promised to Prime Minister Narendra Modi on his visit to Silicon Valley earlier this year.Google will complete its project of 400 Wi-Fi enabled stations by the end of 2017 and 100 stations by December 2016. This will be the world’s biggest public Wi-Fi project. 4. Google’s “Indic” keyboard will help user to type in 11 languages.The app will help the user to type messages in different regional languages on the android device. The languages supported include English, Assamese, Bengali, Gujarati, Hindi, Kannada, Malayalam, Marathi, Odia, Punjabi, Tamil and Telugu.You can check out the Indic keyboard here. 5. Live cricket scores and replays will be available on Google Search from the early next year.Google knows India is a cricket devotee country, and they are bringing live cricket updates through simple Google search. If an international match is being played, then just a simple search on Google regarding the match will give you all the live updates in regards to the cricket match. The feature will go live by early 2016. 6. Project loon will come to India.Project Loon which was announced a couple of years back will come to India. It is a project Google is working on to bring low cost connectivity to the world especially to the rural areas. “We are exploring ways of bringing project loon to India, especially rural areas,” said Pichai. 7. Indian android users will overcome USA. Pichai revealed that in 2016 India will have more Android users than the United States, which is Google’s home market. 8. Improved low speed search. Google has improved its search result to work better with low speed internet. 9. Google will train Indian android developers. 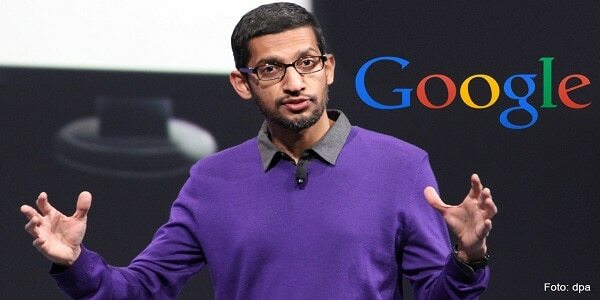 Pichai announced that Google will train over 2 million android developers in India over the next few years. This will provide a huge skilled resource to the startups and will enhance the startup culture in India. 10. Google will introduce a pause buffer feature.The feature will allow users to pause videos, leave it to buffer, even leave the app or site and let it continue buffering.